Click HERE to download from Bandcamp! Available now on Spotify, iTunes, Apple Music, Google Play, Tidal, Deezer and Pandora amongst other streaming sites! Whilst simultaneously working on several albums and genres of music, our first album “Astral Whispers” is now available. Based upon 10 planets in our solar system, the contemporary and experimental album is an exciting exploration of space and sound. The music is based upon radio emissions from planets which were recorded during various NASA missions and subsequently released by NASA as audible sound waves. On Astral Whispers, every music track is underpinned by the sound wave of its particular planet, and then musically explored. Using a variety of music and vocal themes, each track is as unique as each planet. The wonder and mystery of space can now be explored and enjoyed through an exciting and mesmerising journey. The album features a fusion of sounds from space, interweaving melodies and vocals which enables listeners to experience a journey into space from the comfort of planet Earth! The idea evolved after Paul Kirk (composer and synths) heard the fascinating planetary sound waves released by NASA and was inspired initially to compose a piece of music for Jupiter. Fellow band members Nigel Rooke (sound engineer, lyrics, vocals and synths) and Voodoo Jade (Lyrics and Vocals) jumped at the chance to become involved, and a whole album soon followed. We are fully aware that this is not a new concept. British Composer Gustav Holst wrote his suite “The Planets” in the early part of the 20th Century, and in more modern times there have been other people and musicians incorporating music with planetary sound waves. However, we believe that our individual and collaborative styles and experience have helped us to create an enjoyable 21st Century collection of celestial music which science and technology has made possible. 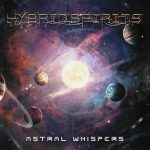 Hybrid Spirits would like to thanks NASA for their permission to use their planetary sound waves in order to make this album possible, and to also thank them for their inspiration.